The “Spanish Plume” is a special weather set-up which can produce thunderstorms in the UK, as well as France and Benelux counties and beyond. 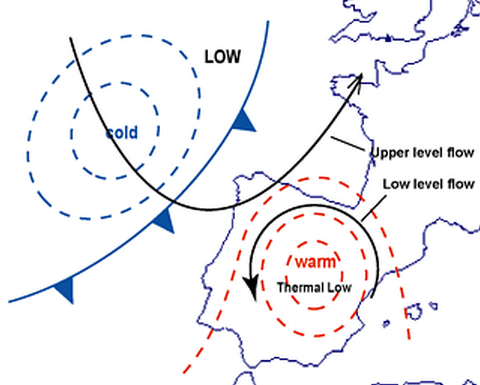 A Spanish Plume is when hot dry air from the Spanish Plateau moves north towards the UK. This occurs when LOW pressure exists in the Bay of Biscay and a HIGH pressure builds further east over Europe or N Europe / Scandinavia. An “omega block” is one such pattern but several different types of Spanish Plume are recognised. As the warm dry Spanish air moves north from Iberia it picks up moisture from the Bay of Biscay, increasing the humidity of the lower layers but retaining dry air aloft. The combination of these two airmasses, moist surface flow and dry upper flow, creates instability and potential thunderstorms. The unstable airmass can further lift over any relatively cooler air residing over N France and the UK (isentropic lifting). The lifting of the air column allows thunderstorms to grow even further. Thunderstorms are directed north on the upper winds and jetstream from the south where, given an approaching cold front, lapse rates can increase further and the intensity of storms can grow over France, Benelux and the UK and further into Europe. The Spanish Plume is a complex weather pattern which needs some special ingredients to prime the atmosphere. Like all thunderstorms, Spanish Plume storms are based on convection in an unstable atmosphere which occurs when thermals of air rise uninhibited to a great height creating tall cumulonimbus clouds. Unfortunately, thunderstorm formation is difficult to forecast, often being altered by local factors below the resolution of many forecast models. The localised nature of storms also means that some places may see a tumultuous thunderstorm of epic proportions while other places not far away will see very little impressive action or nothing at all. Quite frequently plumes will skirt to the east of the UK and miss us entirely, storms staying on the continent, as initial forecasts of a “direct hit” are corrected east. Cool sea surface temperatures in the English Channel can also deflate imported storms from France. So some understanding of the plume might help figure out how much we can expect from any convective action forecast with a Spanish Plume event! The large scale “synoptic” pattern required to prime the atmosphere for a Spanish Plume is for a cut-off LOW pressure to locate around the Atlantic coast of Spain, ideally moving into the Bay of Biscay. The LOW in the Atlantic therefore sits to the SW of the UK. An upper level trough nudges this LOW east across a hot Iberian plateau and France picking up humidity across the Bay of Biscay. Strong solar heating over Spain creates a thermal heat LOW circulation and local thunderstorms here. The stage is set for a Spanish Plume! Warm plume followed by cold front chaser! How does this “plume” head towards the UK and create thunderstorms here? Prior to the arrival of the upper warm Spanish plume in the UK, a humid surface SE flow from the continent feeds heat and moisture into the UK at low levels, steepening lapse rates. SE winds in the UK in summer frequently herald thunderstorms due to the low level advection (movement) of heat and moisture from the continent, both critical to feed thunderstorm formation. Meanwhile, the upper SW flow (jetstream) ahead of the upper level trough pumps warm air from the Spanish Plateau northwards. This plume rides a conveyor belt of air rising towards and over a warm front as it travels north in a warm humid sector. Now an approaching cold front from the west is needed to really kick off storms by destabilizing the atmosphere! The LOW pressure system has cool moist Atlantic air wrapping behind the cold front (seen on satellite pics below as the white line of cloud extending from the mother low to the NW). A warm surface conveyor is driven NE in the developing warm sector ahead of the cold front, guided by upper level winds and the jetstream. The rising warm plume has cool Atlantic air moving in aloft ahead of the cold front. This cool air aloft can override the warm plume, increasing lapse rates and destabilizing the atmosphere further. Sometimes this scenario can cause huge thunderstorms called meso-scale convective systems (MCS) or sometimes supercells. Any solar heating will further rapidly destabilize the atmosphere creating surface based storms where temperatures rise. Storms are often squeezed into a narrowing band or chain ahead of the cold front. The cold front itself often weakens as air tends to sink after the passage of the thunderstorms. The cold front can pass over unnoticed behind the thunderstorm event, its main job is to advect cold air over the rising warm plume to increase lapse rates. HIGH pressure over the Mediterranean can also assist the process by advecting warm / hot air out of North Africa, over Spain, into France and finally reach Britain across the English Channel. The more heat the better. Another important factor in thunderstorm formation especially for the UK is TIMING. The arrival time and combination of unstable air masses, fronts and moisture is what makes or breaks storms. Any element that is premature or delayed can be the death of expected storm formation. The best example of this is whether unstable air arrives during a sunny warm day or at night, when surface based heating is absent. In the case of the Spanish Plume event 7 June, the unstable air arrived at night over a comparatively stable boundary layer surface air mass. The only storms that resulted were elevated thunderstorms embedded in the unstable upper air ahead of the cold front (which oddly brought warmer conditions later in the day as cloud cleared and sun came out but too late to coincide with the impressive instability of the plume). A cap in the sounding can also enhance convection. 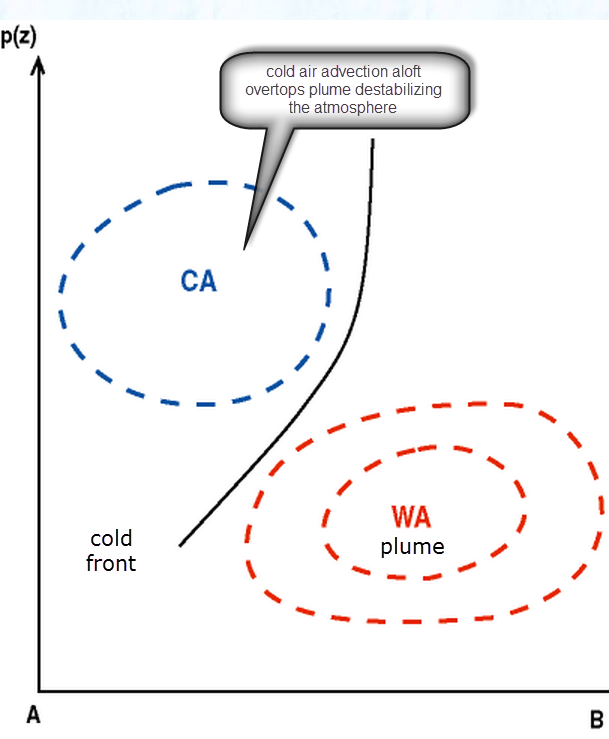 A temperature inversion can hold heated air near the surface building convective energy which is held to the ground until the cap is broken by daytime heating… if it is sunny enough, cloud cover will spoil the event. Busting the cap can create explosive and dangerous thunderstorms, rarely seen in the UK. Heat! the SE of England is due to get warm or even hot on Saturday with Tmax temps well over 25c in sunny spots. This will warm the air at the surface and, like a hot air balloon, these air “parcels” will want to rise (called lift). Warm air is also being moved into the country from the south by a process called advection. Charts showing the heat energy providing the potential for air to rise are called CAPE: convective available potential energy. 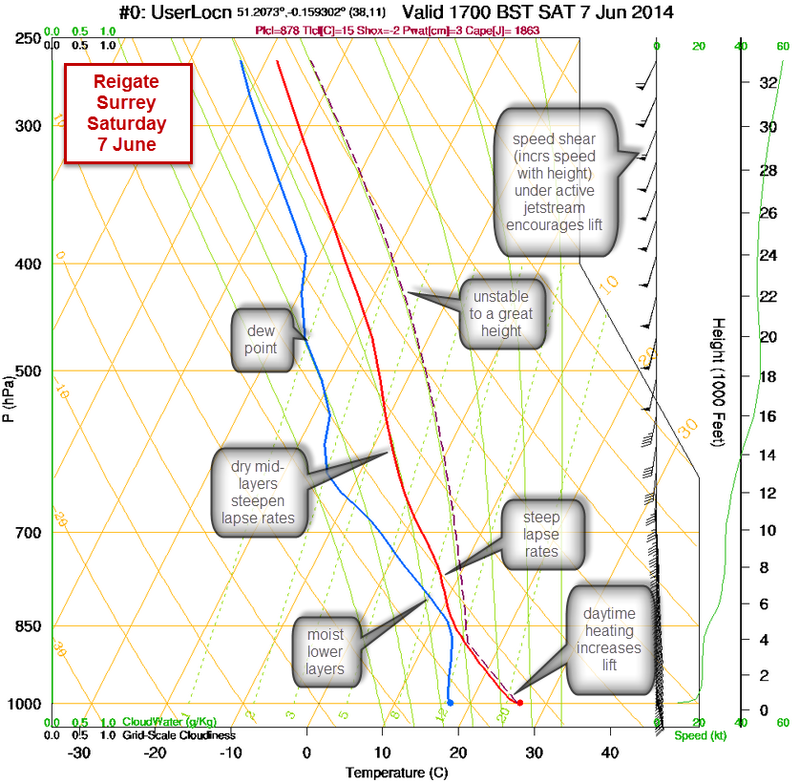 In the UK we are pleased with CAPE values of 200-500j/Kg for some thunderstorms. On Saturday we might expect values of up to 3000j/Kg. The other measure used to assess thunderstorm potential is the LIFTED INDEX (LI) this measures the difference in temperature between a parcel of air lifted to 5000m and the temperature of the air around it. Negative figures show the air is buoyant and ready to rise. Values of -8 or -9 are unusually low and show a very unstable airmass with the potential for plenty of lift! 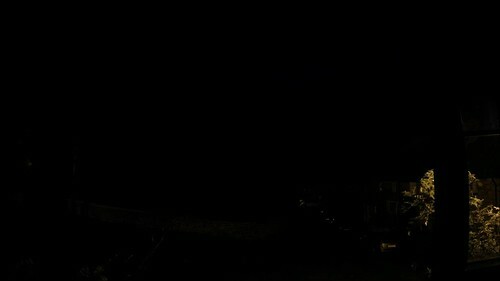 In a Spanish Plume event the upper air contains enough energy and moisture to produce elevated thunderstorms even in the absence of surface heating: this means moderate thunderstorms can occur at night and with extensive cloud cover. The morning moderate storms experienced in the SE on Saturday 7 June were all elevated thunderstorms because extensive cloud cover throughout the morning meant an absence of surface based heating to kick off more purposeful convective activity. Here’s an excellent blog explaining elevated thunderstorms compared to surface thunderstorms that would occur due to surface heating. Moisture! local SE winds are frequent precursors for thunderstorms in England. This is because, in summer, SE winds are often humid with a relatively high water content, advecting (moving) lots of moisture into the SE: high dew points illustrate this with some reaching 20c on Saturday… a muggy humid day. This moisture will be required, of course, to form clouds. To form really big clouds you need a lot of water in the atmosphere. Once water vapour starts to condense it releases latent heat and this heat gives additional lift to convection and feeds thunderstorm formation. Interestingly and perhaps counter to what might be expected, a dry plume of air mid-way up through the atmosphere is also an important ingredient to the production of big thunderstorms. Drier air at mid-levels aloft gives the atmosphere added instability for the production of thunderstorms. The reason for this is that dry air cools more rapidly with height than moist air (because rising moist air releases latent heat when clouds inevitably form and this additional heat reduces the rate of cooling of saturated air with height). The rate of cooling with height is called the “lapse rate” and the lapse rates or temperature gradient on Saturday is steep. So moisture is a critical ingredient to storm formation because it controls instability and cloud formation. The skew-t charts show temperature change with altitude. They are called Skew-t because the temperature lines are skewed off the vertical slightly. Whilst they are initially odd to look at, focus on the red and blue and dashed lines: if the red and blue lines are close together it means the air is saturated (cloudy). If they are far apart then the air is dry. If the red line skews to the right then this is known as an inversion where temperatures can increase or stay the same with height. Such an inversion will prevent thermals rising and the formation of clouds from surface convection, a critical ingredient for big thunderstorms. 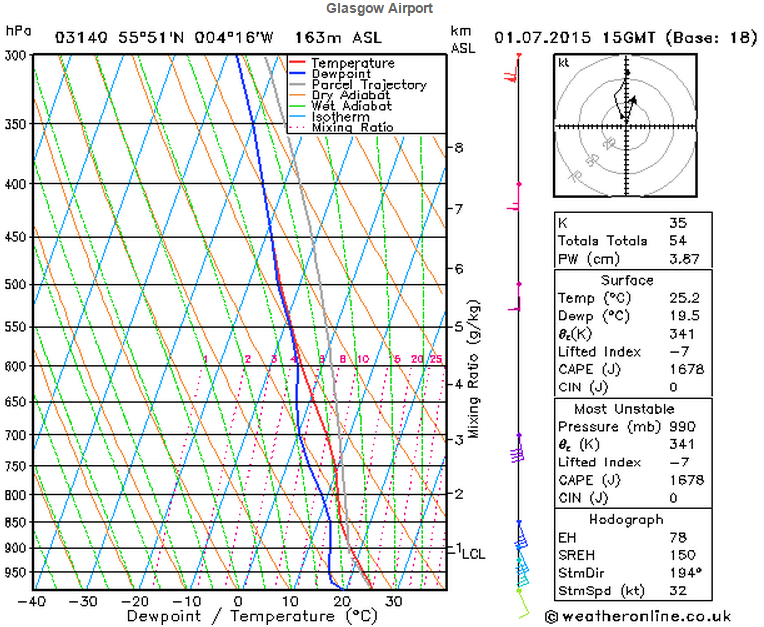 The other ingredient the skew-t chart shows above is plenty of wind shear with height, in this case speed shear. Wind shear is the change of wind speed and/or direction with height. Increasing wind speed with height has the effect of dragging air off the ground like a hoover. On Saturday there is a jetstream moving overhead during the day and this will cause divergence aloft and encourage more air to lift off the surface. Strong directional wind shear, when winds turn at angles through the atmosphere and when different winds directions meet around fronts, is also a trigger for tornadoes. The UK quite regularly has tornadic conditions in lively convective thunderstorm weather but the ingredients for tornadoes are a even more fickle! Our tornadoes are considerably less powerful than those in the USA but can be of great interest and still cause damage by uprooting trees, damaging rooves and chimneys and even tipping cars. Lift! like a hot air balloon, a warm bubble of air will only rise if it is warmer than the air around it. On Saturday morning a CAP will exist in the atmosphere that will prevent air lifting far off the surface, thus preventing extensive vertical lift. 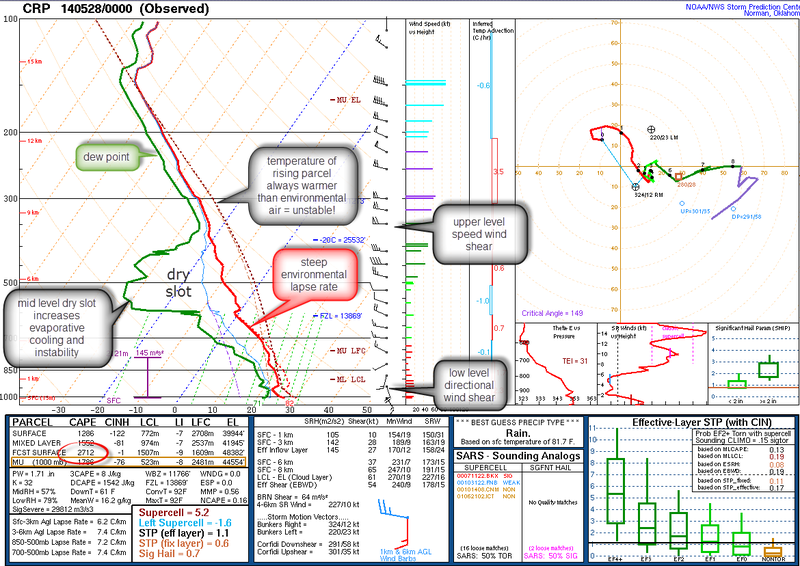 The cap is known as a temperature inversion and the cap on Saturday is pretty solid, so little convection is expected early on, except possibly in unstable upper atmospheric layers which might cause elevated thunderstorms. During the day, if there are suitable breaks in cloud cover, the sun will heat the surface and this will start to break down the cap. A strong cap has the effect of building energy and heat below and, if the surface heats up sufficiently then the cap can be broken suddenly. This usually happens in the afternoon when a sudden explosive thunderstorm could be produced. In the mid-west of the USA tornado chasers call this process “busting the cap” and it produces the possibility of extreme weather. On charts the cap is shown as convective inhibition that acts against convection but, at the same time, can be an ingredient for extreme weather. Another mechanism that is capable of lifting air rapidly is the proximity of fronts which can mechanically lift the air as different air masses converge. On Saturday, a slow moving cold front is forecast to be located along a north/south axis through the Midlands and S England, moving gradually east… this could be the focus of most activity if the cap remains solid further east. Convergence of winds! winds converging at the surface are another local or regional factor that enhances convection. Converging winds at the surface tend to slow down and pile up, like lorries slowing down uphill and causing congestion. When surface winds pile into each other (converge) they can only go one way… UP! Convergence often occurs at the coast where winds coming from the sea slow down due to friction over the land. This is one reason why the south coast often produces thunderstorms or enhances them as they cross the Channel (so long as the Channel sea surface temperature is warm enough – another story!). The other map below shows areas where there is a sufficient combination of wind shear, heating and energy to possibly start to rotate a thunderstorm: rotating thunderstorms are called supercells and are capable of producing tornadoes. These are the “big daddy” of thunderstorm cells and would be an awesome site for anyone able to catch a photo before or after the inevitable heavy rain, hail, lightning, darkening skies and thunder! So the action of winds converging at the surface and diverging aloft or doing the reverse, is important to thunderstorm activity. The charts below (website ) are a cross-section through the atmosphere from S-N and W-E across the UK before and during the plume. The streamlines showing wind vectors illustrate the turbulent nature of the air during the plume. There are elements of both lift and subsiding air at different elevations showing the complexity of the plume event. Even with so many ingredients primed for thundery weather here in Reigate on Saturday it still remains a risk potential rather than a certainty. Local factors might inhibit convection, too much cloud in the morning could reduce surface heating and the cap may not be broken, so no thunderstorms! It’s a matter of waiting to see the conditions nearer the time to make a final forecast and often it remains uncertain until the very day. Nevertheless, there is a possibility of explosive convective thunderstorm action on Saturday, mostly in the Midlands and the East, if the CAP is BUST! If this occurs then instability of the atmosphere will rapidly build extremely tall cumulonimbus clouds up to 10,000 metres tall. The UKMO issued an uncharacteristically early warning of heavy rain for Saturday on the basis of this Spanish Plume event. Others will doubtless follow, but it is safe to ignore the daft scaremongering of the Daily Express but do keep a watchful eye on any dark clouds! Although an accurate forecast is beyond the scope of this post and best left to the professionals, one broad indicator of possible storm pattern over the course of the day is set by convergence of winds and the likely position of the front as it progresses west to N/east. The first plume of instability arrives in N France later on Friday and some might arrive S England Friday pm with low risk thunderstorm activity imported across the Channel from France (as it happened this occured only in the SW). The charts for Saturday below show how the main location of biggest storm activity could move broadly from west to NE during Saturday and clear off into the N Sea overnight. (as it happened the front moved much quicker and clear S England and most parts of Central England by lunchtime leaving a bright afternoon with bubbly Cu). The animation here also shows the total rainfall expected to accumulate during the 48 hour plume event. Whatever happens, do watch out for altocumulus castellanus in clear skies or asperatus undulatus (pic above) or shelf clouds and cumulonimbus developing ahead of storms as the plume arrives on Saturday and then watch for any cumulonimbus clouds exploding if the cap is bust later on! Please send in your photos of any interesting weather phenomenon to RGSweather : on twitter and facebook and email. Comments and any additional information always welcome! May was a month with some convective interest but no explosive thunderstorms for Reigate despite one or two possible moments with CAPE values exceeding 1000 kj. The rapid in-situ development of an impressive Cumulonimbus over the town on a southerly flow on 22 May proved to be interesting for cloud watchers and delivered a well structured gust front but only one crack of thunder and some fleeting cg lightning. Elsewhere in Europe record breaking rainfall over the Balkans caused tremendous floods and there were numerous funnel clouds and spouts from France through to Italy in unusually convective conditions. 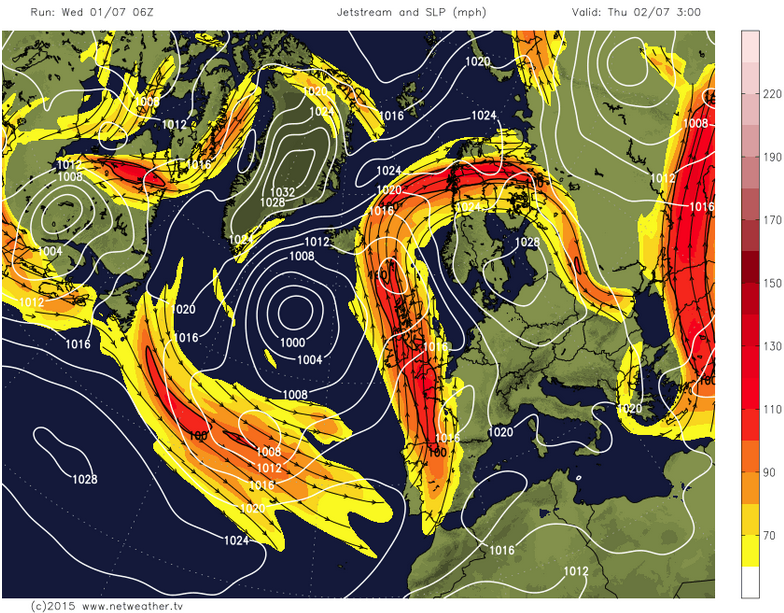 Here are some thundery pics of the synoptic situation in late May. thundery MSC moves across Channel and survives! 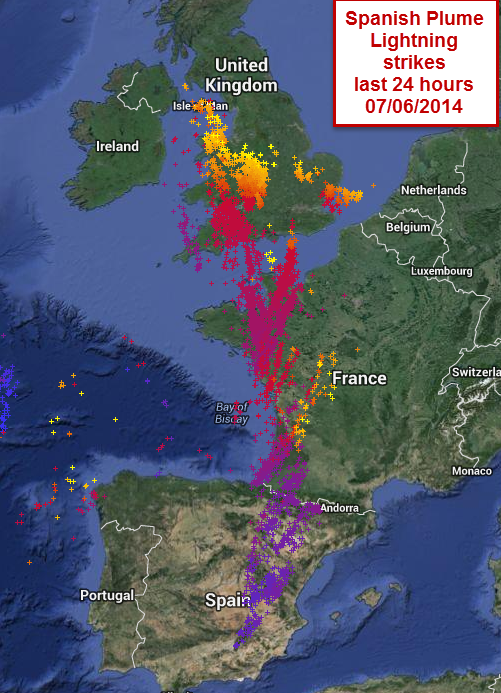 More pics showing the synoptic situation during thundery epsiodes across the UK and Europe.